Victoria’s selection of craft brews is vast — pop into any bottle shop and you can pick from a plethora of locally made beers. But if you really want to immerse yourself in the craft beer culture, you need to go straight to the source. Luckily for us, we’re blessed with a heap of taprooms, bars and pubs, so you can sip freshly brewed beer and get your hands on limited edition releases, just-tapped one-off kegs and to pick the brains of the knowledgeable brewers. One taproom that we’re loving right now is Valhalla Brewing & Taproom. Located in Geelong’s Union Street in a newly developed building (the one with the striking mural of musicians Jay-Z and Beyonce on the side wall), Valhalla opened their very first dedicated taproom back in December last year. Operating for three years under the reigns of founder and owner Scott Hunt, Valhalla is what’s known as a gypsy brewery, where the brewer has no facility of their own and instead the brewer travels to a functioning brewing facility and pays for use of the space to produce their own beer. It’s a cool approach for brewers to take, and it is perfectly fitting for Valhalla, who have been creating craft beer that honours the Viking philosophy: That life is to be lived to the fullest; that life (and, of course, beer) is a gift from the gods and therefore should honour the gift that has been bestowed upon us. Honouring the philosophy, Valhalla create “seriously drinkable” beers, with beers that will excite and interest dedicated craft beer drinkers, yet also provide an enjoyable experience for the average beer drinker. Just take a look at their range and you’ll see what we mean. Some of their honourable mentions include the Obsidian Black Ale (fuelled with black malts with bold grassy hoppiness), their Aragon – India Pale Ale (coined a warrior of a beer), the Gallowtree Oatmeal Stout and the Freya Moon Passionfruit IPA. How’s that for creativity? And it’s a creativity that we can now find situated right in the heart of Geelong. Sharing the street with the likes of Italian restaurant Lipari Espresso Bar, the Union St Wine Bar and Union St Cellars and The Sporting Globe, it’s clear the addition of the independent craft bar will further boast the street as a vibrant night-time destination for Geelong. With a 16 year old dream of opening a bar, two and a half years of planning, and a six month execution, Valhalla Taproom was finally born, giving the Torquay based legends a space to bring the goods right to our doorstep. So what can you expect to find at the taproom? With ten taps in the middle of the bar, Valhalla will feature four to five of their own beers, with some on rotation, while the others taps will focus on showcasing independent Australian and New Zealand craft beer and cider. “We’ve got a wide range available on tap, from our 4.7% Golden Ale, which is a really nice crisp easy drinking beer, more a summer style beer, through to our sort of 6.8% Black IPA, which is smooth and easy to drink big beer. We’ve got a permanent sour tap as well, so we’ll have a sour beer available on tap all the time. “We’ll have whatever is available here,” Scott continues. “We don’t always have our full range available, because a lot of our beers are seasonal, but certainly our core range and what ever is on tap we’ll have it for sale or takeaway.” Yes, you can even buy beers takeaway here. How good is that!? One beer we’re excited about having fresh access to is the Galactaphonic Tonic, a pale ale made in collaboration with 1990s Australian band Tumbleweed, inspired by the band’s 1995 album Galactaphonic. For a beer that was meant to be a one off collab, this one is looking like it will become part of Valhalla’s core range, so far being one of their best sellers. Alongside the beers on tap, you also have access to an ever-changing collection of more than 40 bottled beers, as well as a modest, prime collection of Victorian wines, quality spirits and a casual bar snacks menu including jaffles. As for the space, the unique taproom oozes elegance, class and quirkiness, infused together in the best possible way. With a sort of medieval, gothic and pagan inspired wallpaper covering the feature wall along the left side of the space, the room is brightened with timber tabletops, upholstered bar stools, polished grey floors and gorgeous greenery. 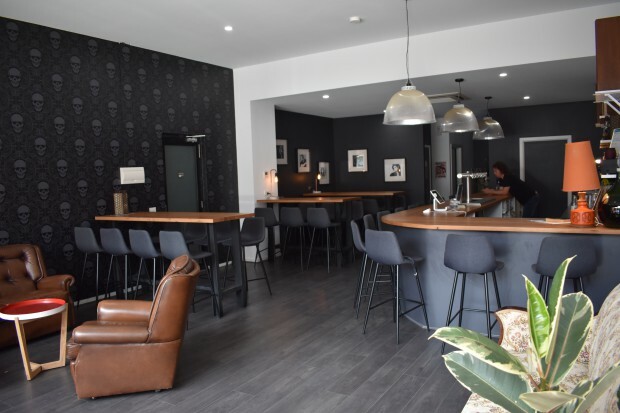 To make you feel right at home within their space, the taproom also features a humble lounge area with retro furniture, boasting a vibe reminiscent of walking into someone’s lounge in the 70’s, but without the kitsch. Alongside the brews and the atmosphere, the taproom also hones in on a connection to music, with a record player, an impressive home collection of rotating vinyl spanning the 70s, 80s and 90s, as well as a feature wall framing some of music greats. “Music is a really important part of our life, and we think music is a really important part of a space like this, for people to create the right kind of vibe or environment for people to come and chill out,” Scott says. With a space so welcoming and appreciating of music, it only makes sense that they introduce live music as well, with acoustic sessions running on Friday nights and Sunday afternoons with young, local musicians. With beer, music, retro vibes and quality tunes, Valhalla Taphouse sounds like the perfect place to us! Valhalla is open Tuesday – Saturday from 2pm, and on Sundays from 12pm. You can view their network of stockists (along with their range) on their website (www.valhallabrewing.com.au).